Born in 1982, Singapore, William belongs to the generation that is first on advancement in new technology, while on the other hand, the last to really experience the good old days. The rapidness in development changes landscapes quickly as the human eye brings on reflection emotionally, mentally, spiritually…… As an architect, William stands at the front of development and conservation. He wishes to capture the intimate reflections through his paintings. His works are well collected privately and by various public institutions. William trains under Contemporary Art Master, Mr. Ren Jianhui. Overseas-Chinese Paintings and Calligraphy Exhibition, Beijing, China. Charcoal Drawing “One Day She’ll Know” featured in American art magazine, Strokes of Genius. Singapore Arts Exhibition, organized by the Federation of Art Societies (Singapore). Federation of Art Societies (Singapore) 21st Anniversary Celebrations: Grand Art Exhibition 2013. Works featured in art publication of Artists Society of Singapore. Singapore Qingdao Chinese Art Exchange Exhibition. Featured at Singapore International Art Fair. “Distinction Award” at the Overseas-Chinese Paintings and Calligraphy Exhibition 2014, Beijing, China. 2015 to present: Vice-President of Artists Society of Singapore. 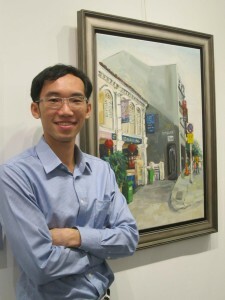 2005 – 2013: Secretary of Artists Society of Singapore.